This edition is well over half way threw the edition it is selling fast. The original aquatint and etching titled Saraband was etched in 1937 in an edition of only 30 and was first exhibited in the 1958. David Jones’ Art Gallery exhibition of two hundred original etchings. This was the largest exhibition of Norman Lindsay etchings held to date until the Art Gallery of Western Australia’s exhibition of all 200 published etchings in 2006. A sarabande is a Spanish dance in triple time and can be spelt with or without the ‘e’. Norman and Rose used both spellings when titling the edition – Saraband and Sarabande. 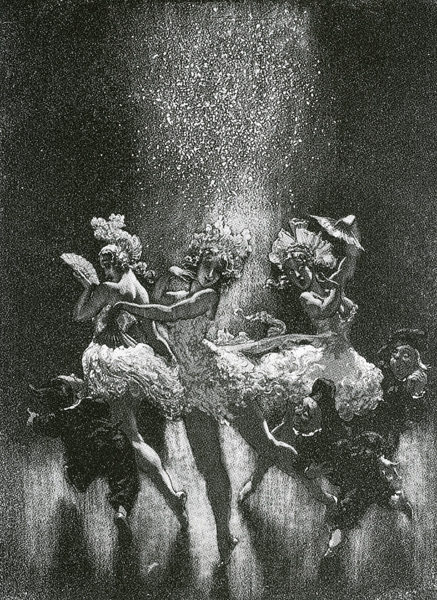 Saraband has only been reproduced in one book prior to The Complete Etchings of Norman Lindsay which was Angus & Robertson’s 1973 volume Norman Lindsay: Two Hundred Etchings.